The cruise ship Emerald Princess Hamilton docked at the Matautu wharf in Apia yesterday, with hundreds of tourists disembarking to enjoy the beauty of Samoa and bring much needed tourism revenue to Samoa. Not far from the wharf, a solemn memorial service led by Head of State His Highness Tuimalealiifano Vaaletoa Sualauvii II and Prime Minister Tuilaepa Dr Sailele Malielegaoi was underway at Vaimoso. Their thoughts were on another passenger vessel, the SS Talune - which docked at the Apia wharf exactly 100 years ago to yesterday. The ship came from Auckland, New Zealand with a deadly cargo - passengers carrying the influenza virus - who were allowed to disembark and spread the disease to the local population. The total number of deaths in Samoa which were attributed to the influenza was later estimated to reach 8500 or 22 per cent of the population. 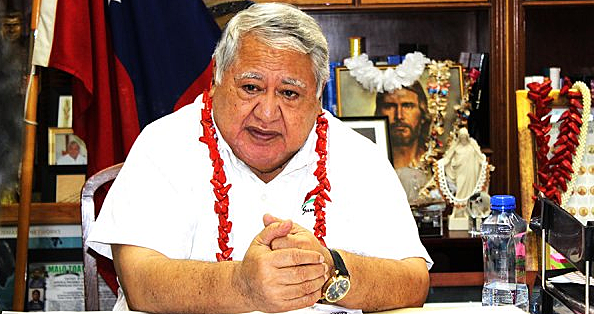 Prime Minister Tuilaepa Dr Sailele Malielegaoi told guests at yesterday’s event that the death toll could have been more. “Possibly more, as many families in the rural, more had buried their dead that were so many, daily without worrying about the need to inform the authorities and communications then were extremely poor, even in my village,” he said. The P.M. said yesterday’s event marked Samoa’s way of reflection on a mistake of the past, and it should not be allowed to be repeated. “We must never leave space for recurrence of any situation that will result in a loss of life, why because out of every tragedy emerges a new beginning, which ultimately should make us more resilient and better prepared,” he said. Acting High Commissioner of New Zealand to Samoa, Nick Hurley, said the New Zealand administration’s handling of the influenza back then was universally criticised, compelling his government to set up a Commission of Inquiry to investigate how the disease got into Samoa, and whether there was negligence on the part of the New Zealand government or the administration of Samoa. Mr Hurley said the Commission of Inquiry first met in May 1919. “It concluded that a number of basic errors of judgement and poor communications had caused the unnecessary spread of the influenza – errors not just by the administrator Captain Logan but by the New Zealand health authorities, the British government, the health authorities in Samoa, the port authorities and the ship’s captain. “The incompetence of the New Zealand administration at the time led Prime Minister Helen Clark to make her national apology in 2002 for the injustices arising from New Zealand’s administration of Samoa in its earlier years, and to express sorrow and regret for those injustices. She acknowledged ‘with regret, the decision taken by the New Zealand authorities in 1918 to allow the ship Talune, carrying passengers with influenza, to dock in Apia’,” he said. As Mr. Hurley said in his speech yesterday, the New Zealand government back and its administration of Samoa came under a lot of criticism, not only internationally, but more so by the local indigenous population. Consequently, historians have over the years pointed to the deadly 1918 influenza epidemic as the crisis that laid the seed for Samoa’s gradual push to nationhood. Historians say that it was the New Zealand authorities’ poor handling of the 1918 influenza epidemic that led to the rise of an independence movement - the Mau and the historical events such as “Black Saturday” that followed a decade later. The P.M. made reference to that spirit of nationhood yesterday, when he said that the tragedy marked a new beginning for Samoa, and it should ultimately make Samoans more resilient and better prepared. Samoa has come a long way a century after the arrival of SS Talune on its shores, and its citizens can only use the tragic events of that juncture in its history to excel and give their best to the country. Which is why it is important to return to the arrival of the cruise ship Emerald Princess Hamilton in Apia yesterday, and to make a connection between the vessel and the progress that this country has made since those dark days. The journey of nationhood has been long and hard, and filled with numerous challenges for the island nation and its 190,000 population. Luamanuvao Dame Winnie Laban is correct in saying that the Samoans have not forgotten New Zealand’s response and how it handled the influenza epidemic back then. Former Prime Minister Helen Clark apologised to the people of Samoa when she visited Samoa in 2002. “On behalf of the New Zealand Government, I wish to offer today a formal apology to the people of Samoa for the injustices arising from New Zealand’s administration of Samoa in its earlier years, and to express sorrow and regret for those injustices. “It is our hope that this apology will enable us to build an even stronger relationship and friendship for the future on the basis of a firmer foundation. New Zealand and Samoa are bound together by our geography, our history, our cultural and family links, and today by our trade and diplomacy. It is important that we are also bound by our mutual respect for each other,” she said. But the Auckland University’s Damon Salesa told Radio New Zealand in an interview that the apology from the former P.M. does not mean New Zealand can forget its colonial past. Therefore, it was logical for Prime Minister Tuilaepa Dr Sailele Malielegaoi and Acting High Commissioner of New Zealand to Samoa Nick Hurley to take the lead in yesterday’s commemoration program. Samoa and New Zealand can only build on the foundations that were laid through yesterday’s groundbreaking ceremony. The announcement of a $2 million support funding for the Community Nurse Centre at the Samoa Nurses’ Association site is a step in the right direction as we work together to right the wrongs of the past and build a better future for the people of Samoa. Have a lovely Thursday Samoa and God bless.